It’s January, which means we are spending a LOT of time in the house with our kids. You might be wondering what you can do to keep your kids entertained and work on enhancing their speech and language skills at the same time. 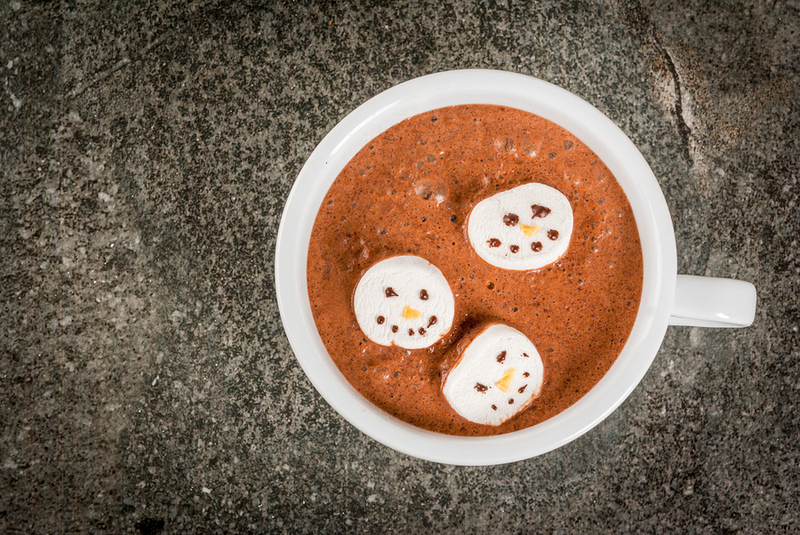 Well, look no further: here are some easy, fun ideas that all revolve around hot chocolate! 1. Make a hot chocolate sensory bin. If you are not familiar with a sensory bin, it is a container filled with materials used to stimulate the senses. The reason that is so special is because it is a tactile approach to learning about your senses, plus sensory play calms, focuses and engages your child. You can make a hot chocolate sensory bin using pinto beans (hot chocolate), cotton balls (marshmallows), whisks, and plastic tea cups and spoons. This targets vocabulary (talk about making cups of hot chocolate), counting (“How many marshmallows should we put in our cup?”), sequencing (“First, let’s whisk the beans, next we will scoop them in the cup, and last we will add marshmallows.”). 2. Make a nice cup of hot chocolate. Kids enjoy the autonomy that comes with cooking in the kitchen, and who doesn’t love a nice warm cup of hot cocoa? Depending on your child’s age, your level of assistance will vary, but think about letting your child pour milk/water in their own mug. This is working on their fine motor skills as well as vocabulary words (“Fill the cup half way with milk.”). Have them push the buttons on the microwave. This works on number recognition and following directions (“Push the one, then the three, and then the zero.”). Then have your child mix in the cocoa. Have them pretend they are on a cooking show and narrate what they are doing as they go! You also can describe the hot chocolate after it is complete, thinking about all the senses: what does it smell, taste, feel, and look like? 3. Make hot chocolate play dough. Mix all ingredients together in a bowl and knead until you have a giant ball of chocolate play dough. You can use a rolling pin and cookie cutters to make different shapes and put the dough in mugs and pretend it’s hot chocolate. Or you can roll the dough into balls and make a snowman. Let your child lead and expand upon their utterances. If they say “ball,” for example, you could respond, “roll ball” to further expand their vocabulary. Hopefully, these ideas will engage your child and help build language through play. After all, play is how your child makes sense of his or her world!